Camp Fire CDC Pre-Kindergarten program implements the Frog Street Press curriculum, which is utilized in several school districts and incorporates all learning components for young children. Aligning the curriculum to school districts promotes children's acquisition of skills necessary for future academic success. Children acquire self regulation skills as they learn to make choices in their classrooms and are exposed to a developmentally appropriate learning environment. Camp Fire has also embraced the nationally recognized Conscious Discipline program. 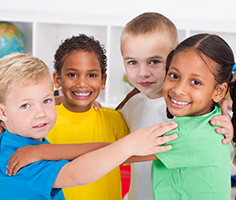 This comprehensive program empowers children to develop self-regulatory strategies and promotes a classroom community model. Camp Fire Child Development Center offers families a fully licensed pre-kindergarten program to prepare children for the kindergarten. 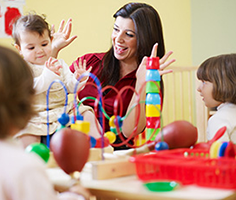 A variety of Pre-K schedules are offered to fit the lifestyles of parents today, such as a partial-day, part-time experience to a full-time program. Camp Fire's goal is to provide children with enriching experiences through developmentally appropriate teaching practices following the framework of the Developmentally Appropriate Practices book. This ensures each child's individual needs are met and sets the foundation for future development. Camp Fire supports families and children by offering on-site extracurricular classes that rotate with the seasons and needs of families in our center. All students enrolled at the Camp Fire CDC have access to these activities, which can include dance, gymnastics, soccer, baseball, cheerleading and more! We also schedule fun, on-site experiences to introduce music, theatre and nature for children of all ages to enjoy.